Three controls. Take control of the two that normally get delegated. Following on from yesterday’s less is more article, I wanted to spend a bit more time about the implications of cutting your dependence on electronic nannies and going all manual – for both metering and focus. It’s actually nowhere near as intimidating as it sounds, and you’ll find that after getting over the initial hump, your photography will be both significantly more satisfying as well as compositionally stronger. You’ll get younger and lose weight, too*. Given that automation has been improving significantly in recent years – and seems to be the one of the sole goals of the consumer end of the market – why am I eschewing it? Surely a camera that makes all of the technical decisions, leaving the photographer to focus solely on composition would be a good thing. Having shot at both ends of the scale and everything in-between, I find that compositionally, the stronger images tend to be the ones where I’m fully conscious and fully in control. I certainly have more fun when I’m driving stick; it’s the same thing for photography, and worth bearing in mind if you’re shooting solely for personal pleasure. If your income doesn’t depend on your ability to nail that tough shot in mid-air, or capture a particular starlet’s split second wardrobe malfunction, then you can probably relax a little. Letting go of inferior frames is not a bad thing at all. One from the D700-85 combination. 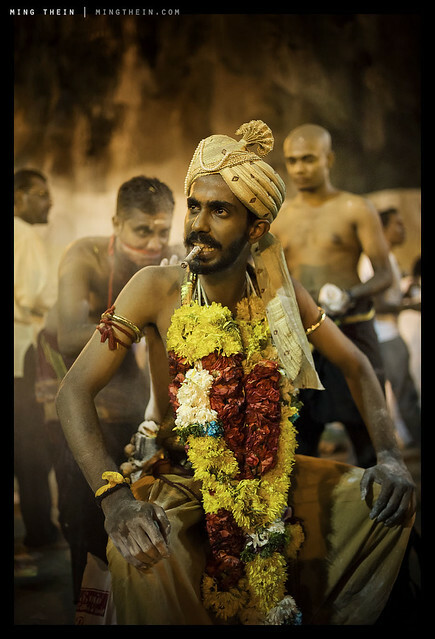 Don’t get me wrong: on the tougher assignments I’ve shot – the Thaipusam festival – tracking autofocus and auto-ISO let me concentrate on timing my moments and being hyper-aware of facial expressions, or edge intrusions, or context. I shot with a D700 and the AFS 85/1.4 G. the problem was, I got artistically stronger images the following year shot with a Leica M9-P and 35/1.4 ASPH FLE – that set can be seen here on Flickr – despite having to not only focus manually, but also set exposure manually too – the M9’s meter is notorious for being distracted by any point light sources in the frame, resulting in wild underexposure. Given we were shooting at night inside a cave and that’s all the light there was, it meant I was pretty much on my own when it came to judging exposure, too. 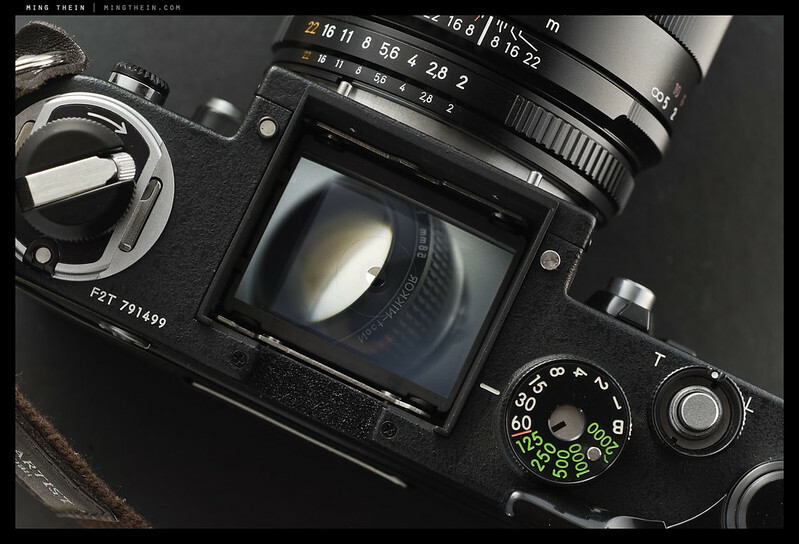 Leica M9-P and 35/1.4 ASPH FLE. So, what changed? I think most of it boils down to increasing conscious awareness of light; since you need to be constantly aware of how much light there is, you’ve also got to decide what exposure to set: do you meter for the highlights, the shadows, or somewhere in between? It forces you to think about how your tonal choices affect your compositional balance: if you expose for the highlights, there are going to be large dark areas that must be accounted for; conversely, if you expose for the shadows, what aren’t you going to be able to see because it’s now overexposed? On top of that, it’s necessary to think about the technical limitations of your equipment, too: jack the sensitivity too high, and dynamic range is going to be severely compromised. How does this affect your tonal scale, and in turn, the aesthetics of the final shot? The really important takeaway here is that there’s no such thing as a right exposure for any given situation: there’s a right exposure for your end intention, and it’s up to you – not the camera – what that should be**. **I previously wrote a comprehensive article on understanding metering – though not really the focus of this article, it provides useful background reading if you haven’t already seen it before. Death of a bollard. Hasselblad 903 SWC. Think about these things enough, and you’ll eventually develop an instinctive feel for a given situation – not just in terms of what metering setting to use, but also what feel you want your final image to have. Having now shot seriously with film for several months, I can safely say that over time, you spend less time worrying about the exposure and more time thinking about your composition (having fewer shots available probably also has something to do with that). The upshot is that my hit rate with film – note: manual metering, manual focus, manual everything – the cameras I use are entirely mechanical – is much higher than with digital, simply because I’m forced to think more. I do try to bring that discipline back to digital, but somehow the temptation to keep iteratively hacking at a scene, refocusing, tweaking composition and adjusting exposure compensation is too great; we do it anyway, partially because we can, and partially because it’s just a very difficult habit to break. 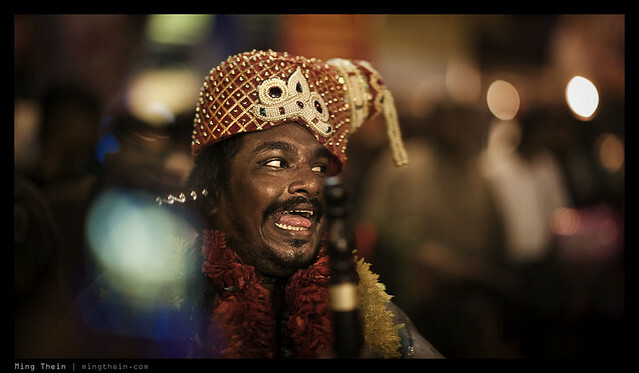 I haven’t talked much about manual focus: why on earth would you consider using that at all? Simple: we’ve now gotten to the point that autofocus is so complicated that it’s actually quite a challenge to set it up in such a way that it delivers consistent and repeatable results, and even then, the camera can still be fooled. I’ve experienced this personally quite a lot, and to be honest, most of the time when I’m on a commercial assignment I’ll be focusing manually anyway – depth of field must be carefully managed to ensure your focal plane covers the critical elements of a scene, but you don’t kill image quality by stopping down too much to allow diffraction to take hold. The only fly in the ointment is that modern cameras are simply not engineered for manual focus to begin with; the exception being the Leica M rangefinders. Our DSLRs have bright but small and not very snappy focusing screens; too many slow consumer zooms have necessitated this, along with the loss of the split prism or microprism focusing aids common to every manual-focus-only SLR. Why? Two reasons: firstly, to make a good focusing screen is very expensive; the best ones are made from precisely cut bundles of optical fibers, often have a fresnel grid cut over the top to enhance light collecting ability, and are both bright and snappy. The other reason is a technical one: the slow aperture zooms that have become so popular for the majority of the market do not work with split focusing aids – they will cause one half of the split to black out at apertures of f5.6 and below, rendering them useless most of the time. Compounding this is the lack of precise mirror adjustment: what you see as in focus is not what the sensor plane sees, simply because the distance between lens mount and sensor or lens mount and focusing screen is not the same. This costs money to properly align, too; it’s at odds with healthy margins on entry-level cameras. Even at the pro end of the market, alignment is dire: every single DSLR I’ve bought has had to be corrected for proper mirror alignment straight out of the box. Film SLRs? Rarely, and even then, only after decades of hard use. What about mirrorless? Well, aids such as peaking, magnification, in-body-stabilization and true WYSIWYG viewing via EVF make manual focusing easy; in fact, much easier than with the current crop of DSLRs. Their limitation is that almost all of the lenses have fly-by-wire focusing rings with neither hard stops nor consistent lens displacement proportional to ring displacement; they tend to try and be too clever and move further when you turn the lens faster. Let’s just say it makes manual focus challenging, and pulling focus for video nearly downright impossible. If you’re willing to use an older legacy lens, it’s pretty easy to focus – but then you’re compromising end image quality by using optics that may have other compromises such as telecentricity or resolution. « Less is more: what does a camera really need? While I love manual focus, I’ve frankly never bothered with manual exposure. And at the same time, I don’t really care much for what my camera thinks about exposure, either: I usually shoot in aperture priority mode, and if the exposure doesn’t look right on the LCD or in the EVF, well, then I change it on the fly via exposure compensation. My OMD can display a live histogram or zebra patterns for over/underexposure, so I can adjust the exposure to exactly what I want without metering anything myself. WYSIWYG just makes it so easy to both be in control and have all the convenience I desire! In a way, this manual metering on DSLRs seems to me like those car handles you needed to turn to kickstart the motors of old cars in the era before the car battery. Of course on the other hand, if my car battery ever dies I’m SOL! So this makes me much more dependent on the electronics of my modern camera! I’ve got two film cameras as well (an SLR and a rangefinder) and with them I spot meter on my motive (like a person’s face) to make sure that’s exposed correctly. But I don’t think that’s the right way (it’s certainly not the Adams zone system) and I imagine it would become extremely difficult to use spot metering *and* spot-AF at the same time. I guess that’s what AE-lock is for, but pressing that button, then half-pressing the shutter button, then re-composing … sounds awfully complicated to me. I don’t think this button makes sense on an EVF-equipped camera though, so I don’t think I’m ever gonna need it. Or do I? Might finally learn the zone system one day though. No do-overs if you don’t have an EVF; by the time you’ve peeked at the LCD and adjusted your exposure compensation, the moment may well be gone. And let’s not even talk about film. It’s still necessary to have an understanding of exposure to maintain creative control – it’s a compositional choice as much as a technical one, especially under difficult lighting situations. Exposure controls what’s revealed and what isn’t, and therefore has implications on composition. Yes, I absolutely understand the necessity on a DSLR or film camera! However, I wonder how necessary this is in a world of mirrorless systems. In fact this is why I like EVIL cameras so much: they just get rid of all those distractions and only present the final image to me, on the fly. At the same time I’m still totally in control, creatively: I can expose to the right, or in such a way as to get exactly the exposure I want. I’ve never owned a DSLR camera is my life, so this just got past me. I might still learn the zone system one day, but I’m not sure how practically relevant this will be for me. The biggest problem I have with my old analog cameras (they’re just an experiment, nothing serious) is anticipating the available dynamic range. I.e., knowing how the shadows will turn out when I expose for the highlights, and vice versa. As far as I know this can only really be calculated by means of the zone system. Otherwise it’s just guesswork, isn’t it? Less necessary these days, but the more information/ understanding the have, generally, the better the creative choice one makes. I know this may sound crazy, but do you think it is possible that someday Zeiss may seriously consider developing focusing screens for ZE/ZF.2 users? They’ve just launched the new Otus line and nearly all the official samples were shot with D800/E, and we are convinced that other ‘no compromise’ but manual Otus lenses will be introduced in the near future. My interpretation is that Zeiss is giving a new life to the MF community by equipping it with the ‘best’ lenses on this planet (although this is partly because for various reasons they cannot make AF lenses for Nikon/Canon). But I don’t think Zeiss expect all of us to use the green dot and live view all the time as they do post three links to 3rd party focusing screens on their website (ironically, two are no longer functional while Katseye doesn’t offer a solution for D800/E). I can only hope they do! It would make sense though. You’ve managed to create some anxiety (perhaps not with everyone) with the statement ” every single DSLR I’ve bought has had to be corrected for proper mirror alignment straight out of the box.” Your knowledge about the technical aspects of cameras and your work undoubtedly allow you to present a convincing case to the manufacturer for repair or adjustment, but how does the average amateur go about knowing, and then proving to the manufacturer, that this needs to be done? Not easily, unfortunately. If you can’t consistently focus a reasonably fast/ long manual focus lens, or if you’re consistently back or front focusing compared to live view, chances are something is off. Great article. You know, when I first started taking photography seriously I shot with a bessa-r, a fully manual rangefinder. I loved the pure simplicity of the camera and the huge viewfinder. Some of those photos are still my favorites. If I could afford a digital Leica I’d be all over it, but perhaps I should break out my FE2 or my bessa-r2a (I sold the R) and go film for a bit and see if anything changes. Hi, another really good article. 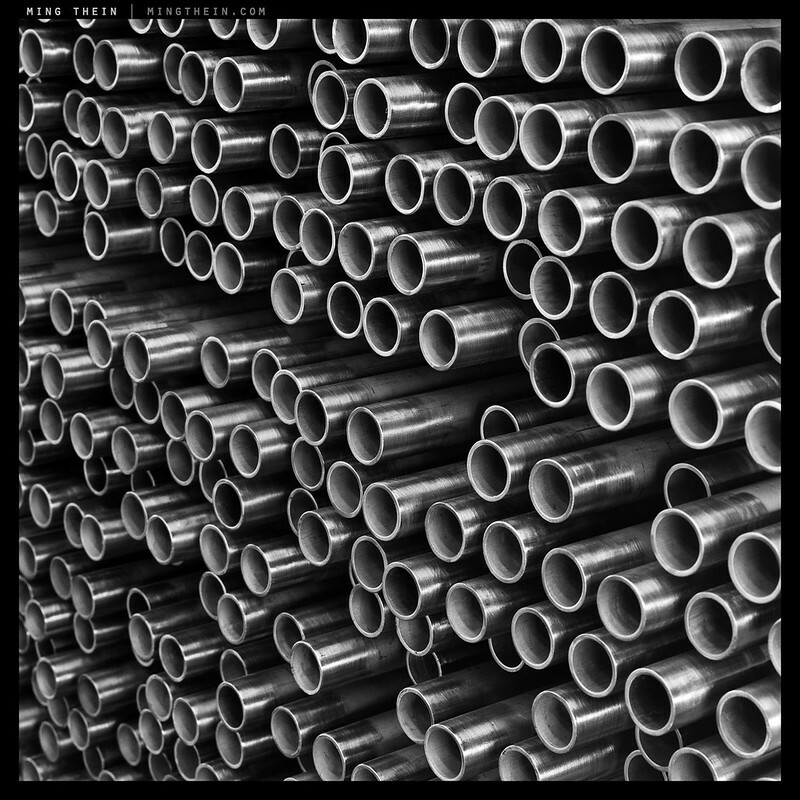 I like the tubes photo, and it occurs to me that there is something of Escher in it. I can see it the tubes as all receeding in depth to the left of the frame, or as appearing to be on a flat surface, or the top left corner and side can flip (like a necker cube) so that the tubes appear to receed in depth towards the right. I wonder if anyone else sees this effect? Have currently glued (I joke) my old canadian made 35mm summicron to the camera – wonderful. How do you find the corners? I tried my 35/1.4 ASPH FLE on the OM-D and the corners were a disaster til f5.6, after which diffraction made everything soft. A shame; that lens was truly outstanding on the M9/M240. If you would like i can email you a couple of photos and you can have a look. After shooting with automatic exposure for years, first with my Canon AE-1 and A-1 and then with my Nikon D70, i read Bryan Petersons book on exposure and decided to try manual. Silly, I first thought, I will just be manually setting what the automatic would have set anyway. It turned out to be everything else than silly: I am now only using automatic on my D7000 when I am shooting something where the light is changing faster than I can turn the dials! I now use manual with spot metering where I usually try to expose to the right by metering the brightest point to about +1,3 (I used +2 with the D70 but that is too much on the D7000). I no longer have to use exposure compensation for more than 50% of the shots as I can immediately see on the exposure meter if I am + or -. I have also reconfigured the AE-L button to be an AF-ON button and am only using the center autofocus sensor. The only thing I am missing is that while shooting raw I would like the histogram to show the figures for the raw file and not for a jpg that has been white balanced etc. Thank you for a very nice blog Ming! In instances where manual is not practical, spot metering and placing the metering area very precisely is just as good, and faster, too. But it requires some practice and a relatively static subject. Unfortunately there is no way to get a histogram from a raw file because the data must be converted first (monochrome sensors are an exception) – however, what you can do is set the JPEG settings to be as low contrast as possible – which will be closer to the raw data – the histogram will reflect this. Experimentation would be far more useful than any book – try changing one variable at a time to see the effect. You might also find my Fundamentals video useful. No, I agree that none of the modern DSLRs have good finders; it’s the lousy focusing screens that are bright but not snappy. Put a custom screen in, or use an older film camera, and life is much easier. My F2 and F6 have finders that are worlds apart from the D800, and let’s not even talk about Hasselblad V.
What lens is that on the F2T in the first photo? I really don’t get it–I’ve seen several articles in the last several weeks that extol the virtues of manual exposure. I am relatively new to photography (about a decade), but I’ve never done anything but manual exposure. I don’t know why anyone would let the camera make the decision. You lose control. I always do some test shots when walking into the situation, look at the LCD and histogram to see what is happening, and then from there I adjust the three variables to meet my needs. It works. I shoot both Canon and Leica, with the new Olympus XM1 or whatever it is numbered on the way. Hardly rocket science. On the M240, I find the rangefinder to be far more accurate than all the new hocus pocus peaking nonsense. Providing your calibration hasn’t drifted, and your subject is in the center, and the lens you’re using doesn’t have focus shift. The problem is, no two lenses quite agree properly (though the longer DOF of one might cover the bias towards the other) and the focus will drift eventually. It got to the point that I was carrying a toolkit everywhere when I shot Leica in the past. Ming, you shot Leica in the past, so what’s your preferred setup to avoid carrying the toolkit. The only problem I have had with the Leica in terms of focus is the center patch does require a little extra work if you are trying to focus on something on the outer thirds of the frame, but I can usually get it right. Of course, I don’t use the Leica for some things, like a lot of concert photography where musicians are moving around and you don’t have the luxury of time. Then I switch to the Canon and the Olympus will also be useful. I have found focus peaking on the Leica to be less than useful. When the light is great, it works fine, but in a dark nightclub I don’t see the aids. You do pay a big price for it in terms of battery life. I am not mechanical, but I would be interested in what tools you are using and how easy it is to fix the rangefinder. So far, not a problem for me, but it would be nice to have some self-help skills. Not easy. One special tool for the vertical RF; several allen keys; L-shaped screwdrivers and an alignment rig to check near/ infinity focus. I really wish Nikon would make a digital camera as stripped down in controls as the Leica M9 or M Typ 240. They need something with a shutter speed dial, a great viewfinder for manual focus like the F4 (or at least F3HP), but with a sensor as good as the D800/D800E. They could leave off half the buttons of the current DSLRs and cut most of the features that most people don’t use and have a camera that actually makes it easier to take great pictures and weighs less than a kilogram. Sadly the designers are probably hamstrung by the marketing department anti-gurus who think adding more features and menu items makes cameras easier to sell. So I expect to never see a retro control Nikon DSLR. Maybe Fuji or Cosina could make one some day in F-mount, but that seems unlikely too. We can only hope. I’m still holding out for a digital F2/ FM3a equivalent. Even if it costs as much as a Leica, which it really shouldn’t – considering they’re giving us less stuff! How about an EP-5 (future EP-6) with a built in EVF (ala GX-7)…? It seems like it would be really close to an F2. I’m surprised that non of the camera companies have taken Apple’s lead in terms of form / function design and less is more. Three dials (shutter, aperture and iso) or so may be all you need… What could be easier? I’d be interested in your thoughts on that. Going fully manual seems to be quite the opposite of this. Miksang seems to say that ‘seeing’, without the encumbrance of thinking about the mechanics of photography, is the way to go. What do you think? I’m not familiar with it. I agree with the seeing part, but if you can’t control your camera, how on earth are you going to ensure what you get is what you see? It’s impossible. Another great article Ming that resonates with me. I learned how to take pictures back in the day with a Nikon FE and a few AI prime lenses. I would recommend this method to the youth of today. The cost of entry is minimal and the equipment is top notch. And you can’t help but learn a lot. You have no choice! I’m not a pro so I don’t need the very, very, very best glass. I remain the weak link in the chain, not the equipment so I don’t really feel like I am compromising anything. I’m having a blast with spilt image or rangefinder focussing, manual metering, Delta, Acros, Velvia, Provia, filters and being in control – not as much of a control freak as Ming of course 🙂 but one nonetheless. It’s very satisfying. As is this blog and the refreshingly high level of discourse. Cheers for continuing to do this. I always look forward to your posts and the commentary. Your approach sounds very sensible. I haven’t re-ventured into slide film yet as I’ve got to find a good lab first, but it’s only a matter of time. Enjoy! 6 x 6 color slides are just gorgeous! I’m sure they are. I need to make some! If the sun is out next week, I’m going to go for it. I still got a box of Velvia 50 120 that I got for free in the freezer, but it’s still waiting for the right camera. Don’t wanna put it in the pre-war Rolleiflex 😉 6×6 positives must be absolutely mindblowing! Plenty of nice cameras around that’ll take 120… let’s see, I never could get excited about the Mamiya RB/RZ 67 ones, but the Mamiya RF — the 6? the 7? ah, you know the one I mean — is nice. As is the Fujifilm Texas Leica thing, the GX-sommet-sommet; came close to going for one them. I mean it just looks crazy, but the images that body and lens kick out—no laughing at that. Plenty of smiling, though, no doubt. The holy grail is the Bronica RF645 — Gordon’s got one — I’ve never yet seen one but heard plenty of legends about it: yeah, it’s almost like a mythical camera to me. Umm.. OK, yes, sigh –> Hassleblad. The 500 series seems to be the only series [though you see the odd x-pan thingio here and there]. Pentax 645? I’ve never used Pentax, buy you hear niche opinion, or the brand feels niche to me anyway, about them being for serious photogs… that Nick Brandt book—hearing he did it with Pentax was another notch on the belt for their rep. There must be a ton of other makers and models—and the MENTAL thing is you can pick up all this equipment for about the same as a Nikon D3200, or something stupid. Even the Hassleblads can be had. If we really really try. And don’t tell our wives what we’re up to, etc. Casually perusing the used Bronica corner at a local camera store, I noticed an ETRSi body [a Bronica 6 by 4.5 format camera, really good] for, wait for it… 10,000 JPY! 😮 Just bananas. Not a junk camera, a functioning camera—100 USD. Beaten up, but working. You could get yourself a razor sharp optic for it, the newest ones they made before wrapping up business operations, one they made in a brand new lens factory which was the best tooled and the best QC’ed in the World at the time they built it and then made these lenses in it, yes, a lens for this camera with this lineage, guess how much? 6,000 JPY. I wanted to buy the set there and then just on principal; but I already have a beautiful Bronica and I have a Panasonic 4/3 format camera for that aspect ratio when I want it. I also don’t have any money [after a certain other purchase that happened yesterday]. But anyway, what would you like to load that Velvia into Richard? Hello Tom, thanks for the long reply! First of all how I aquired the Velvia, it’s pretty straight forward. My uncle owns together with his brothers an optical and camera store. Though they only carry Leica and Panasonic in the camera department (too bad getting a Leica from them is still not an option since the margin on those cameras is about 5%) they still carry film. So whenever I’m over there I try to talk whoever is in charge of the cashier at the moment to give me their nearly expired films. This way I got some TMZ, PanF and HP5 in 35mm and PanF and Velvia 50 in 120. Just some rolls but since I’m a slow shooter more than enough and who can complain if it’s free! The Bronica RF seems really rare but looks great and is also affordable. ETRSis are really stupid cheap nowadays, depending on the prism they cost you less 250$ for a complete camera, it’s nuts! Probably gonna go with that one for starters. Optics seem to be superb and on 645 I’d get more shots per roll! Still not decided about the handling though. Do you also have an ETR or a different model? 4×5, I can not imagine :o. I guess you wouldn’t even have to make prints, just hang it by the window. Cheers, I guess that was the longest comment I’ve ever written, but this blog is also totally awesome. Thanks Ming! I joke, tell her. Tell her everything. Do it early. Do it smooth—shoehorn it in with some good news or as you cook her dinner, etc. Oh, crikey Richard, I’d be your best friend if I lived in Germany—your Uncles sound very kind and their shop amazing. I think I’d actually be very happy to run a little camera shop and just clean the merchandise all day and talk to customers and go out for long photo-walk lunches. Long posts are welcome on the internet. It’s not real paper, so write away! Let us wage war on short attention spans, empty performance and ironic distance. I think the wife has given up on me in that respect. Also true for a lot of other things. Richard, I have the Fuji GW690 “Texas Leica” that Tom mentions, and it is a fun camera that produces whopping huge 6×9 cm negatives. There are a few caveats: the camera is completely manual and has no exposure meter, you get 8 shots per roll of 120, which I suppose would be useful for using up free 120 film, and people look at you like you’re using the camera equivalent of clown shoes: the camera looks like someone applied a 1.5x scaling factor to a Leica, hence its name. The shutter noise is somewhat akin to someone bouncing BBs off a tin roof, too: the camera says “Ping!” when it exposes a frame. A fun alternative might be the Fuji GA645Zi, which is a pretty small zoom lens point and shoot with full automation, including AF, that produces portrait format 6×4.5 frames. Either camera is available on the used market for not much money. Have you seen those B&W disposables by Ilford? Well, you do get a whole camera with the film, right? You do. Fuji can do the same thing, in color for 600yen. Kodak — completely destitute kodak, can do it for 650yen. But both color, admittedly. You have to hand that to the sales dept., at Ilford: they know they are the only ones in the market. But a B&W disposable. Does it get much more hipster than that! Don’t tempt me, I still got to finance my winter vacation this year! 😉 Enjoy Amsterdam! Ming, I’ll be curious to see how your DSLR scanning rig deals with the high Dmax of slide film. Maybe it won’t be a problem with the D800 and its very high DR and high-bit RAWs, but it is said that DSLR scanning is not great for slide film compared to traditional film scanning. On the few frames of underexposed RVP50 I’ve tried to scan with my NEX-5N, it’s been tough pulling stuff out of the shadows. I’ve seen that Leica photo before, and liked it, but I haven’t noticed the last Hasselblad one in previous posts – it is a really great, iconic, classic image. It’s tough to really get comfortable with manual focus on most of today’s cameras. When I feel like driving “stick”, I pull out a Nikon F3 and have at it. Actually, now that you mention it, the center-weighted metering on that camera real clicks for me. I rarely lose an exposure due to poor decisions even though I have more to think about than with digital. I agree with Ron though, for fleeting moments, I would have a worse hit rate with all manual controls. I’d probably end up with 1000s of rolls of film with unusable frames like Winograd did. It’s tough to really get comfortable with manual focus on most of today’s cameras. I think with practice, the hit rate problem can be overcome. I shoot more carefully, and perhaps a bit differently with film – my hit rate is of the order of 80-90% with film; 5% with digital. 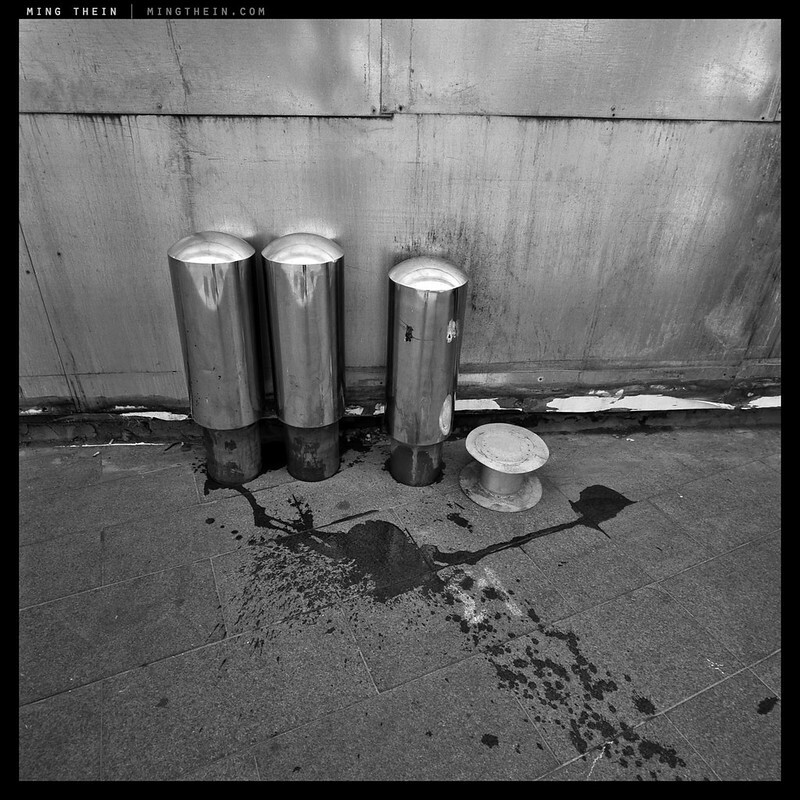 And yes, I even use the Hasselblad for street photography. I’m also very conscious that practice matters though! Thanks for a very useful article, Ming. It makes me dwell on the photographic process for a minute. I bought a D800 just a couple of weeks ago, an upgrade from my D300 (which I liked a lot) but I am quite bewildered by all the menu choices and the possible impact of combinations and settings and this and that. I would have loved the D800 sensor in a a more basic house. Your article reminds me of so many other cross-overs in visual art. I wonder if actors are tiring of green screen yet! As a long-time amateur, digital opened so much ease I found myself losing the joy of taking good pictures. I made a huge decision to go with manual settings and extreme minimal post-processing. For my blog, if the picture needs editing it doesn’t make the cut. No more spending gobs of time sifting through photos and editing at the computer. I’m out practicing, honing, and taking more pictures! Lovin’ every minute. Here’s my write-up about it. Another great article and a perfect follow-on to the minimalist article. After the first three paragraphs I though to myself – this is what I did shooting film for 40 years (Yaschica-Mat, Nikon F, Nikon EL, Nikon FE2). I used a Weston Master V meter with the first two (still have it). I like my D7000 but after two years I’m still referring to the manual and trying to figure out auto-focus, focus lock, exposure lock, matrix metering, etc. On my just completed trip I just put it on aperture preferred and center-weighted with fixed ISO and manual WB. Occasionally I’d switch to spot metering. Auto-ISO works well enough but then you have to engage exposure compensation sometimes or AE-lock so fixed ISO seemed easier – more like film. I forgot about adjusting WB a couple of times but overall I was happier with the results. It does make you think more when you do it this way. Try running the spot meter and AE-lock instead – works better with auto-ISO; no need for exposure compensation if you put the meter box over the right area. Ming, this is a really inspirational post. To date, I don’t think I’ve tried the M setting on my mode dial. I’m an enthusiast stuck in the PAS modes as I’m intimidated by the fully manual controls as I am still in the early stages of learning theory and technique. I’m going to reread this post a few times and finally give the M setting a try (maybe even with some of my legacy Minolta MD glass). I also want to let you know how very much I love the Welding Man image. I really enjoyed your two posts on the metal working client, but I don’t think I gave that particular image the scrutiny it deserves. It’s simply spectacular! I’m especially fond of the really intriguing double diamond flares along the top right as well as how they offset the circular hole in the pipe on the top left and the deep layering across the composition of the image (both in physical features as well as highlight/shadow). All I can say is WOW! Try M: given that there’s no penalty for experimentation in digital, it’s the fastest (and really only) way to learn. You can go manual exposure with AF glass, too. Welding man: thanks. But the internet shot doesn’t even come close to doing it justice. 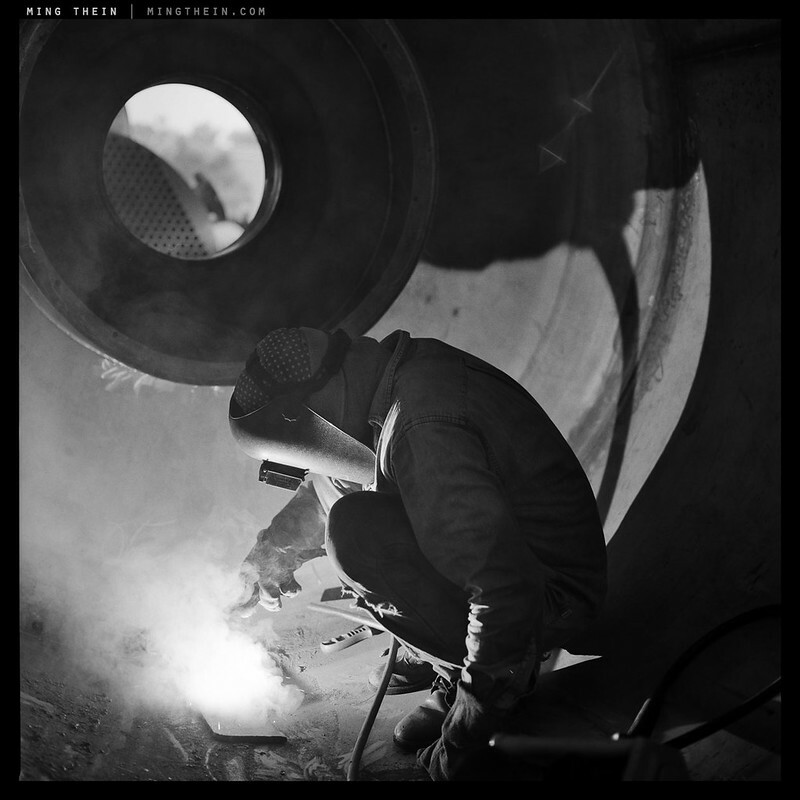 I sent the client a 24×24″ print on baryta; it’s gorgeous in another dimension. Just a coincidence, but that particular photo probably cost me hundreds of euros. I need to get a new laptop soon, and was comparing a “retina” macbook with a regular one in a store. I quite liked the increased sharpness when viewing my own flickr uploads, but that welding man and the smoke looked absolutely stunning in terms of sharpness and tonality, and much better than on the regular display. Probably still a magnitude worse than a large print, or even Apple’s 27-inch display, but it convinced me to go for the expensive high-res option. To keep my back intact I only sit at a desk at work, or when doing final PP at home, so the investment should be worth the pleasure. Darn, too bad I don’t get any commission from Apple, haha! I’d started in AF-C and dynamic area [the panel]; kept acquiring wrong target, or acquiring subject but losing him as soon as he did his moving about. Switched to AF-C and tracking, should have done it, but no luck—I had 51 point 3D on, and this was too many points and the camera got confused quite a bit, often switching to a passing car or bicyclist. Then tried single point, AF-C and endeavored to keep the point on him—succeeded but composition all suffered, not a single keeper from any of it. All the while he just wouldn’t stay still when it was go time. Even when I asked him just to freeze for a few seconds to let the camera get a lock on him. But he was just harried and jittery, couldn’t listen to me and was pacing up and down all over the place. But not the D3’s fault. I can guarantee with absolute certainty, this same situation and light, and this same camera and lens [85G] in the hands of a pro or seasoned and confident amateur –> they are walking away with the shot after 5minutes of horsing about in the middle of the road for photos at sunset. My unfamiliarity with the camera — not at the point of “extension of me” necessary for this kind of photo, perhaps — was to blame. Part of that: the available functions — and my subject — making me rush, too. Majorly. Wouldn’t happen with a better photog. They’d get something. One frame, at the least. I got none. Zilch. Binned every one of them. And let’s remember, this is not perfection merchant MT and the like we’re talking about, it’s anything goes Tom—the bar for an OK from me is very, very low indeed. And this said, if I’d just walked out there with a manual lens on the D3; or with the F2, or something, I’m confident I’d have gotten at least something from it. And, reading this article and reflecting on it, torn over whether more automation would’ve saved me; or sunk me. Spot meter on his face, single point AF-C or 51 point 3D tracking AF-C, locked on his face first. That is all. I find that automation frees me to concentrate on composition. A lot of what I shoot is fleeting anyway. Mostly I use AF single point, aperture priority and auto iso changing the aperture and minimum shutter speed as needed. The D800 has a lot of dynamic range, so goofs in exposure can be absorbed if they are not too large. I don’t think a low hit rate in digital matters as long as there are enough good ones left over. If it wasn’t for digital, I probably would not be shooting. Just what I would do with all that time, IDK. Your thoughts are always enjoyed and force me to think about what I am doing regardless of whether I agree or not. That is good. I used to be a regular reader of your blog until i stopped for some vague reasons of lack of time, but still pursued my photography “journey”; i had long wished to be able to shoot with my hasselblad that was sleeping in the drawer but did not want to go back to film, too cumbersome. Then I recently got a CFV-39 digital back, and went through the exact same path you describe – i found all my compositions stronger, because I choose my focus point in advance, my rough exposure selection comes often naturally from years of practice of automatic exposure, and just like you said you adapt the shot to the quantity of light. One thing though is that years of practice of auto-exposure are actually a very efficient training. And I think it’s probably only when you have reached a stage of maturity with the modern DSLR that you fully appreciate the increase control it gives you to go manual, it may be very frustrating to someone unexperienced ? You really need to have a strong understanding of light before going manual makes sense. And beyond that, a real sense of clarity and purpose to your image: you need to be able to previsualize. I’m finding the CFV-39 slightly frustrating at times, though: the crop factor is small but enough to change the FOV slightly so that I now have to think about it rather than the compositions being instinctive; rectangularity is annoying, and most of all: it’s about one stop less sensitive than it claims to be. Still, the results are really excellent if you get everything right…in that sense, treat it like slide film, and I find all is well. To any beginners who may be reading this: if the idea of manual exposure appeals to you, and you’re the type who likes to do your research and likes learning by trial and error, I highly recommend you try it, based on my own experience. I find it enjoyable and rewarding; for me, I think it was the best way to go. The camera I enjoy using the most–and I get good results with it–is manual exposure only, its light meter is disabled (I don’t put batteries in it) and it focuses manually (scale focus! ): a Rollei 35 SE. A few weeks later, I bought my first film camera and started guessing exposure without using the in-camera meter (no batteries). I did some research on shooting without a light meter, which of course involved the Sunny 16 rule, and looked at Exif data from my X100 photos (and I may have made up a couple of “rules” of my own… And I may have made a table of exposure values in Excel…!). From my first roll of film, there was a bunch of very overexposed photos, but since then, most photos have turned out well. Film is forgiving though, so when I try to use my X100 like I use my manual film cameras (ignoring the exposure indicator), it’s sometimes disastrous! Well, I’m still a beginner–there’s still a lot of learning to do! I suppose if I really want to become good at estimating exposure, I should practise on the sensitive X100. I forgot to say that I also agree the fact that those manual lenses perhaps are more satisfying our nostalgia, even our snobism, than real effectiveness. Internet is not the best place to make an opinion about image quality, but I’m really not convinced with what I have had seen. I can understand one buying a manual 25 or 45mm f:0.95 which have no AF equivalent, not buying nor using a manual 25mm or 50mm f:2 or f:1.4. But that’s just me. I suppose part of the satisfaction for some lies in the feel – if you like to use your equipment, you’re more likely to go out and shoot with it, which in turn produces better images through practice; but this is more of a by-the-way than a direct correlation between the two. – Philosophically I agree with you. For example each time I meet a subject in consistent light conditions, I set a first shot or two, then go to manual exposition to prevent reflections or back-light or what else, even with my super sophisticated EM-5. Nevertheless when going aged, AF and IS are _very_ appreciated features, perhaps mandatory ones. I’ll nevermore be able to hold my camera as steadily as only ten years ago, nor to glance as well. If I buy the AF lacking fish-eye I’m thinking, I will use hyper-focal. – As many, I think that one’s photographing skills are far more influencing the resulting sharpness of their images than the lens they use. So oldies are actually not my cup of tea what belong to lenses, although I am as much as many people nostalgic of those magnificent pieces of craft we enjoyed in our hands. I think the IS system is the really big revolution here – the stability is truly impressive; it’s the one thing I miss in every other camera I use. Without it, MF is much more difficult, and magnified MF is nearly impossible. You are right: shot discipline makes far more difference to final sharpness/ resolution than the lenses. Any advice for setting up the OMD-EM5/ P20/1.7 combo for this style of shooting, Ming? Not really. The modern cameras work better in auto-ISO, aperture priority and spot metering simply because of the control layout. Depends if you’re running and gunning or have time to set up the shot properly – matrix if you don’t have time, spot if you do. Saves having to use exposure compensation if you can precisely lay the spot. If I may disagree a little with Ming here … I used an E-P5 with the PL 25/1.4 in almost full manual mode for the metering exercise described in Ming’s video (which was also my 1st assignment for his email school), and the setup is pretty straightforward The only automation I used was AF which was triggered only by the back button. Exposure was set manually with the assistance of the spot meter. ISO was set to 200 or 800 depending on the light, and also because most cameras cannot auto ISO in manual mode. It is true that this is a lot of automation still, but I think it goes with the spirit of what Ming describes above, which is getting as much deliberate control over a camera’s actions as possible. For example, knowing the meter likes to give me 18% grey, and deciding beforehand whether a scene would be high key or low key, I’d meter off something that would get me the look I wanted. That set the exposure for the scene. I’d then wait for the scene to come together, focus (or usually prefocus) and take the picture. It is definitely a more deliberate, contemplative kind of shooting than the 10 FPS spray-and-pray that’s too tempting with digital. This works great for action too but you definitely have to know your subject, and shouldn’t rely solely on the speed of your camera to get you the shot you need. It’s all about anticipation. I found myself looking at cameras differently after this exercise. Some things I used to value weren’t so important anymore, and some things I’d never thought about are now paramount. #1 on my list: the camera retains all settings, including focus distance, when you switch it off and on again. A more general way of saying this is that the camera doesn’t do anything unless you tell it to do something. This is making an electronically driven camera act like an old mechanical camera instead of a computer. That is, its state is retained just as if you have mechanical controls that you didn’t touch. And it’s surprising how few cameras do this amongst the mirrorless set: Sony NEXes will AF even if you don’t touch any controls (the 7 can be configured not to do this while retaining AF), and Fujis will randomly change the focus distance if you change the exposure or power cycle the camera. The other feature I wish cameras had is a program shift for manual mode. That is, once you set your manual exposure, let the user shift up and down equivalent exposure values (eg. higher shutter speed and wider aperture) like what the Hasselblad locked exposure rings let you do. This is great if you decide you need more depth-of-field, or if you have a great 5-axis IBIS, shift to a slower shutter speed to get some motion blur, but close down the aperture to maintain the same exposure. A more general way of saying this is that the camera doesn’t do anything unless you tell it to do something. Yes! The E-M1 will do this, with any of the MF-clutched lenses like the 12, 17 or 12-40. The other feature I wish cameras had is a program shift for manual mode. That is, once you set your manual exposure, let the user shift up and down equivalent exposure values (eg. higher shutter speed and wider aperture) like what the Hasselblad locked exposure rings let you do. I think that’s actually the ONLY camera system which gives you that option – it’s because exposure on the ‘blads is keyed to a constant EV – there’s a scale for that on the underside of the lens barrel. I find it invaluable, personally. And better yet that all of the controls are on the lens barrel – gotta give them full marks for intelligent camera design. What appears to be clunky and nonsensical on first encounter is actually very, very well thought out. Some Rolleiflex models have EV coupling that can be engaged or disengaged. See paper pages 18 and 24 of this Rolleiflex manual for information about EV coupling. I stand corrected – thanks! I inherited a Kodak Retina IIc—shutter by Protor Compur and it has the EV lock system, just as Andre describes. If you look at that trashy snap I linked to [and no more links to my pics, I’m sorry, it’s just been serendipitous the last few days], you can see the EV values on the picture left [going from 18 on down…]. You can set EV directly using the slider on the bottom of the screw-in lens barrel [please notice that lens is by Rodenstock! ], and when you look at the top of the barrel, you notice that is also functioning as the aperture slider. The shutter set is a ring around the lens, what most photogs would guess is an aperture ring on first glance. So, you meter, you set shutter speed and aperture; or just set EV. And there, done, it’s a lock in. Just turn the big shutter ring when you want to change aperture+shutter sets. This camera is from 1954. P/S the film advance is on the BOTTOM of the camera! On the baseplate! I LOVE this nutty little thing!! Yours for five minutes when you come to Tokyo, Ming. Woohoo – perhaps it was just an older film era holdover from the zone system? The halcyon good old days before some smart salesman figured out they could get away without having to service real needs or invent stuff, or make it better; you can just concoct a faux-problem to solve and convince the punters that pet smile beauty mode is what they wanted and needed [instead of 14bit RAW recording, or… etc]. Nicely done, Ming. I think you’ve explained the satisfaction I get when I put my 50 year old Nikkor 56mm F1.4 onto the NEX6. 56/1.4? That’s a very very odd lens. Another great article – I concur with most of your assertions. Focus by wire can be frustrating but I’ve become accustomed to it for some things. Sometimes I like having the magnified “MF Assist” kick in automatically when I turn the focus ring. Focus peaking is also a very welcome development – a few glimmers of peaking in magnified view usually let me know when I’ve REALLY nailed critical focus where I want it. If they are not going to provide me with a bright, fine screen like on my old Nikon F3, the EVF certainly is the next best thing – in many ways the next better thing! Thanks. I do agree that MF has become easier because of LV magnification (and stabilization) – I honestly haven’t found focus peaking that useful, probably because the Olympus implementation is laggy, and if you max out sharpening (doesn’t affect your raw files) then you get a bit of a glimmer anyway around the in-focus edges. The Leica RF lenses will only be good if the sensor has offset microlenses to correct the non-telecentric exit pupil. Lenses that are excellent on the digital Ms like the 35/1.4 ASPH FLE have very poor corners even on the OM-D, which uses barely 1/4th of the image circle. 50mm and up is better; the 50 Summilux ASPH is pretty good, but watch for CA. Seems like the telecentricity of SLR lenses should improve the performance with mirrorless cameras (compared to non-telecentric rangefinder lenses which cause problems) because the almost parallel rays will not mess up the image in the sensor corners, and will not need offset microlenses, nor software corner color shift corrections. For example, the Leica R and Voigtlander SL APO lenses, and the Zeiss ZF lenses should all be spectacular in image quality when used with an adapter on a full frame mirrorless camera, although certainly not small or light weight. I wasn’t specifically referring to older SLR lenses (which may lack resolving power/ microcontrast); RF lenses are prime candidates to go on mirrorless because of size and optics, but they are definitely NOT telecentric, and it shows in the corners. Most of the SLR lenses are quite good, but I do still find blooming/ edge issues. And of course the size defeats the point unless you need something special purpose. Yes, I remember you telling someone in these comments to always bring a marker when pushing film a couple of weeks before that happened! My bad! The FM3a’s meter is actually quite good for metering eye training: it’s the match needle system showing all possible shutter speeds, so you know at a glance exactly how much you’re out by (compared to what the centre-weighted system reckons, anyway). It’s very good, from memory. I didn’t have any problem using it with slide film. It is, and very consistent compared to the modern matrix meters I was used to before getting it (it was my first film camera). I only shoot with M9. So I understand the importance of manual is, especially in getting powerful composition! A great article for aspiring photographers! great article , i started shooting with an old heavy east German praktika and some asa 100 film .i am talking the year 1988 . I use no ttl-flash. Manual settings works best for me. Outdoors i use hyperfocal, in the Studio manual focus. I have to agree with the premise of getting back to basics. I consider it to be the same as a musician being proficient with scales, chords, theory. Once those are known, he or she can then explore and expand upon their abilities. Naturally, there are a few gifted souls who need not do that, but they are the exception. Photography is similar. When one fully understands the building blocks, the basics, one can then use such knowledge to advantage. Is it an absolute requirement? No it is not. However, the benefits that arise from doing so are many. As an aside, for the last couple of months I’ve put down all my digital gear (except when absolutely necessary) and gone back to basics. My 32 year old Nikon FE, a 1974 Nikkormat fun and a 1996 Nikkormat FT2. Loving it again. Ming, if you get up Byron Bay area, let me know. Will do! Thanks for the offer. MT, as a complete aside, when are you going to update your black, pretend film frame to have the two V notches. Then it would look like the real deal for us old folk. Haha, probably never. That would be fake and inauthentic in the same way as those horrible hipstagram borders that have “RVP50” on something that’s black and white! According to her Twitter this is actually 120 scanned with borders. Thanks Richard. I’m glad to be completely wrong! How depressing is that twitter conversation though – the assumption is that a pro is using instagram, not 120! Extremely. I blame it on those app filters having fake film codes etc in the borders; like ‘RVP100’ on a B&W image – AARGH! Heartening in a way, shows I’m not totally lost to photography. Haha, yes, I saw “RVP” a couple of weeks back after trying that first roll of Velvia! Not pertinent for reversal film, but on color neg—I’d read a blog article stating the correct color balance for a film is gotten from sampling the lettering printed in the borders with the WB dropper. I tried it and, yes, it kind of works. I say kind of, because I don’t have a snazzy plugin for removing the color mask — I do it by hand and eye with HSL — so white balancing tends to look penultimate, at best. But I thought that feature of the films was really neat (assuming intentional, sure it is). I doubt it’s intentional. 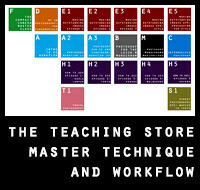 But figuring out a balancing workflow for positive and negative films is something I need to do before the scanner goes out, hence one more reason for me to try that load of Provia in the ‘Blad…I think ultimately I may have to photograph some color charts for the correct calibration/ profiles though. Well, I’m a few rolls into it so far, and the bad news is that, I suspect, the color mask in color negatives is not as simple as a uniformly dense layer of colored material in the emulsion—just as though we’d placed a colored film over the lens. No, I don’t think it’s as simple as that, since I’ve had a hell of a time neutralizing it [if it were a uniform color filter, this would be simple to correct]. I think that the mask density is non-uniform and a function of the exposure chemistry, i.e., the way the emulsion has reacted to light throughout the frame. We have areas of lots of density, some of little; the negative itself — the image — is the map of this distribution. As I understand it the color masking chemical binds and acts in tandem with the colored dyes which create the hues and their tones for us: the mask is thicker/thinner [depending on what we say it’s relative to] where more/less exposure has occurred, in perfect step with the behavior of the dyes in the emulsion. Color negative films, when designed, are designed and matched to a partner printing paper [the assumption being of a darkroom printing process] and the same color mask is also in the paper—so when the paper is exposed to the negative in an enlarger we get the perfect tone inversion AND mask neutralization. The mask disappears perfectly. I did shoot a color chart for each film I’ve used, in proper daylight conditions, yada, yada… and WBing off a perfectly calibrated target there, DOES NOT solve our problems. More to it than that. I just eyeball and guess now –> it’s been way more successful than the color chart. I’m not surprised, to be honest: color balancing color film has two challenges: either you go for accurate/ perceptual color to suit the scene – ie as per digital – or we go for color accurate to the film: this is very much to taste.